...to maintain a normal posture on a long and difficult ride. I may even have been riding with poor hand position putting too much stress on my wrists but can't really recall. Add to this a lot of guitar playing and the fact that I'm on the computer all day at work and I guess it was inevitable something like this would eventually happen. I ignored some warning signs - pain on the outside of the elbow, tingling in the fingers, soreness, but kept riding because... well, suffice to say, I haven't needed to be out riding, and riding hard, so much as I did the first part of this year. I've been concentrating on losing the excess weight, have cut out alcohol and junk food and do my best to eat human sized portions. I haven't been doing the core exercises as much as I should, but have basically rested my arms and hands as much as possible for 2 months. While I'm still not 100%, its a lot better and I can play guitar without pain for an extended time. 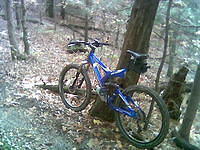 I decided I needed to get back on the bike (to accelerate the weight loss) and I went out again this weekend. I hit my local trail, but decided to do only every other black diamond. Hitting the first and skipping the next, etc. just happens to cut out all of the most difficult sections and cuts the ride down to 8.5 miles. I was very conscious of hand position - making sure I had a good straight line down the arm, wrists not bent. I was careful not to grip too hard, but its difficult in some sections where you have to hop logs or get through moguls, or do climbs. I managed the ride in an hour, but by the end my hands were starting to hurt. I started riding with my hands just resting lightly on the handlebars with the thumb on top (not safe) for brief sections of flat trail because it was starting to hurt where the thumb connects to the wrist. I seems like I need to adjust the bike a bit for comfort. I think the frame is a bit big for me (its a 20"), though I've never had a problem like this till this year. I really feel like I need to have the grips bent slightly more toward me on the outside in order to have a really straight wrist. Its possible some differently shaped grips could get this effect for me without major mod to the handlebar itself. My grips (the second pair I've gone through) are totally shot and this might be part of the problem. I may also move the seat forward slightly, though it took a long time to find the current position and I'm nervous to start going down that road again. So far, so good. I did have some minor swelling of the first finger knuckle immediately after the ride, but theres been no (new) pain. My arms and fingers feel like they need serious stretching all the time now, and I try to do this as often as I remember to. It felt great to be outside, breathing the fresh air, hearing the sounds of the wood, flying down the trails. I've really missed it. update 130825 Went out again today after wrapping my grips in leather to test a couple different ideas for improving the situation. I also realized that my Cateye is the one from the road bike and I don't think I recalibrated it (the road bike is 27" and the mountain bike has 26" tires) so the distance it reports is about 5% higher than reading. Given that, I did another 8 miles today skipping the BDs I skipped last time (did half). Good ride. No pain so far.